Battling opponents may be the focus of many deck-building card games, yet rarely do those games involve actual battles. SunTzuGames’ upcoming kickstarter, Burning Rome, puts the focus on the battlefield as you build decks using the ancient armies from the factions of Rome, Carthage, Celtiberia, or Gaetuli in quick skirmishes. 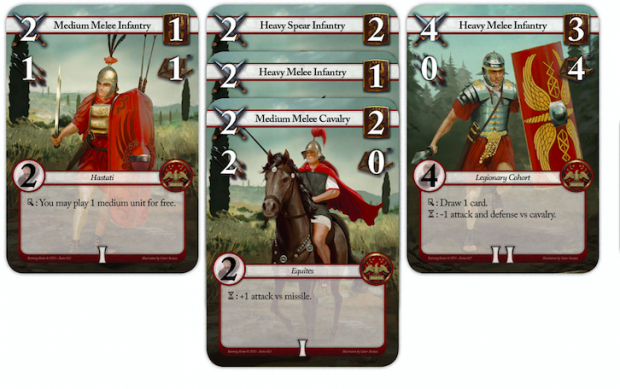 Each faction comes with 54 cards, from which you can choose generals, regular units, and auxiliaries to populate your forces, while tactics cards can enhance your armies’ offensive or defensive abilities in the heat of battle. There’s a wealth of information on each unit card. Every unit has an attack and defense value for use on the battlefield while also displaying a command point cost that you must spend to deploy that unit. Additionally, many units have skirmish and siege values as well. It doesn’t take long to figure out which units are offensive, defensive, or well suited for either role. When playing a card, you must consider its offensive and defensive capabilities, as well as its cost. Some units also have special abilities. For example, cavalry may get attack bonuses versus missile troops, such as slingers, while spear infantry get defensive bonuses versus cavalry. Overall, you’ll be rewarded for bringing a balanced army to the field. Bringing nothing but strong offensive cavalry to a fight would have several drawbacks. Each army also has two values that are critical to your side’s success. The first is your army’s strength. Unless it has a special ability to retreat, a deployed unit will stay in the battle until its conclusion. An army strength value is used to determine the strength of the units you’ve deployed. If this value falls below zero, your army has been destroyed. The other value to remember is your command points. These are spent to deploy troops on the field and act as a way of measuring your army’s composure in battle. If this falls below zero, your army is routed from the field. It’s wise to not overspend here, though points can be restored by not drawing a card from your deck for a turn or through certain special abilities. In deck construction, the sum of your army strength, command points, and unit costs must not exceed 45. Having a lot of units but few command points to deploy them may hinder your ability to fight, while skimping on army strength could result in a quick defeat. It certainly adds a lot to the game that you have to consider more than just army composition. SunTzuGames suggests several ready-made decks for those that aren’t into deck construction. These premade decks are well balanced and an excellent way to ease yourself into how units complement each other. Here, the Romans have a strong middle and right flank, but their left flank is exposed to a strong counterattack. Once your deck is ready, it’s time for the best part of the game: the battles. The battlefield is split into three flanks: left, middle, and right. Since the attacker goes first, they must lose one command point and draw one fewer card as a balancing mechanism. With their initial four cards, the attacker then decides whether to draw another card or gain two command points. Then, they can use as many of their command points as desired to deploy troops from their hand to the battlefield. Deployed units cannot attack until the following turn, so the early battle is the attacker probing their opponent’s defenses. Once the attacker’s turn is completed, the defender repeats the same steps, choosing to draw or build up command points, and then deploying troops to counter their opponent’s play. As you deploy troops, you decide which column they go into. Each column can have up to three cards. If a column already contains one, your second unit would cover up all but the attack and defense values of the first card. This simulates the layers of units in each flank of your army. If your unit has a special effect that goes off immediately, you activate that ability when the card is played. However, should your unit it have an ongoing ability, it can only be used as long as that unit isn’t covered by another unit entering the battle. Attack value for an army is determined by adding up the attack values of the first and second units in a particular column with the skirmish value of a third unit. The corresponding defensive column on the field adds up the defensive values of its first two units and the siege value of its third unit in the column. If the attack has a net advantage, that difference is subtracted from the defender’s army strength. If not, the attack yields no damage. You follow the same procedure when the defender counterattacks. Again, an all-out offensive flank may prove costly if its defensive values are particularly weak. The quick battle system alone makes Burning Rome a game worth keeping an eye on, but SunTzuGames plans on future expansions that will include campaign modes to enhance its value. Look for Burning Rome on Kickstarter on July 18.